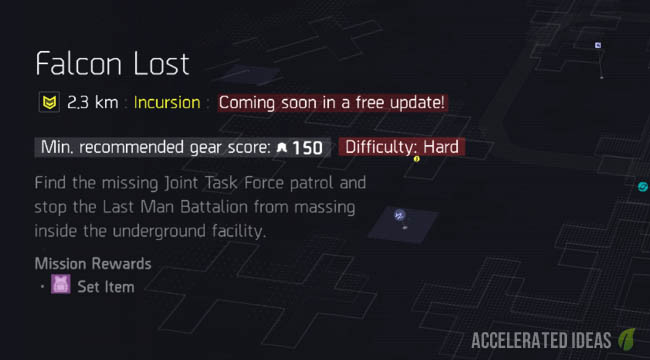 Thanks to Ubisoft's Year One video we knew that Incursions were coming in The Division but what we didn't know is that the first mission, called Falcon Lost, is already on the map. One particular player spotted the new group based activity after reaching Level 30. Incursions are group based, end-game activities that allow players to engage in a Strike or mini-Raid type activity. For non-Destiny players: Strikes typically follow a theme and contain one really awesome boss at the end of the activity. On the other hand, Raids are much longer and typically contain several mini-bosses and then one final enemy at the end. Depending on the length of the activity, loot may drop at checkpoint intervals or as one final reward. In The Division, rare loot comes in the form of Gear Sets. This exclusive gear can only be obtained through Incursions - similar to Raid Armour and Weapons from Destiny. It is likely that one piece from the set will drop (via RNG) each time you complete a particular Incursion. Payers won't complete an entire Gear Set until completing the Incursion several times. Most raids also contain "mechanics", the term used by players to refer to a particular problem that must be solved with teamwork or a precise sequence of events. We've seen navigation puzzles, timed sequences, staged boss fights and many other mechanics in Destiny which may also feature in The Division. "Find the missing Joint Task Force patrol and stop the Last Man Battalion from massing inside the underground facility." Difficulty is set to Hard and the reward is a Purple Set Item. Incursions are end-game activities which are only visible and unlocked once you reach Level 30. Indeed, the person who first spotted the activity did so by mistake and didn't notice the marker on the map before level 30. Gear Score is another important requirement for playing Incursions and it's used as a benchmark to ascertain whether you're ready for the activity or not - similar in many ways to Destiny's Light Level which was used as an indicator for Strikes and Raids. For Falcon Lost, we know that the recommended Gear Score is 150, meaning that players must have found and equipped several pieces of gear with Gear Score values. The exact value required for each piece will vary but the important point is that your accumulated score should be as close to or above 150 if possible. Players can only find gear with Gear Scores after reaching Level 30 and not before. It's then a case of RNG scavenging, crafting or buying to continuously build up your Gear Score. Like Destiny, it's possible to play below the recommended score but the enemy's will be extremely powerful in comparison. Only you will know if it's worth taking the activity early or holding out for a better Score. For more information see the Gear Score post. Falcon Lost takes place in a Water Treatment Plant which is under the control of the LMB, in particular Captain Perez. You need to take that back for the people of New York. New enemy drones will stop campers and force-ably flush you out of hiding areas. Matchmaking is included, for both Hard and Challenge modes. There are currently no checkpoints for Incursions. No weekly lockout - you can play Incursions as often as you like. First play through per week will offer great rewards, then subsequent tries will reward decent rewards. The Falcon Lost incursion will be released on April 12th for Xbox One, then followed by PC and PS4 thereafter.